It can be intimidating for first-time guinea pig parents to clip their cavy’s nails. And, truth be told, it can certainly be a tricky, stress-ridden adventure for experienced cavy owners as well. That’s because those tiny, adorable feet are just so… tiny! Handling those delicate tootsies – which are no bigger than the size of your human pinky nail – is enough to make you second-guess yourself. Obviously, the last thing you want is to hurt your precious fluffball. Well then, it’s a good thing you’ve come upon our guinea pig nail care guide since we’re about to demystify trimming and clipping guinea pig nails with some tried-and-true advice. Clipping vs grinding nails – which is better and what are the differences? Clipper vs grinder: which one should you choose? Typically, cavies require minimal grooming, though it may depend on the breed of your guinea. Within their grooming regimen, you’ll need to set aside time for nail trimming on a regular basis to maintain your pet’s health – not just for the sake of appearance. Guinea pig toenails grow continually. And, what you may not realize is, when not trimmed regularly, cavy’s nails not only grow longer, but they also tend to curl. This curling, thus, impairs their ability to walk. Since their nails do not receive enough wear to keep them at the proper length, it is therefore essential to trim cavy claws at least once a month to avoid excessive growth and curling. Typically, at my house, I trim my sweet little Muffy’s claws every three weeks. 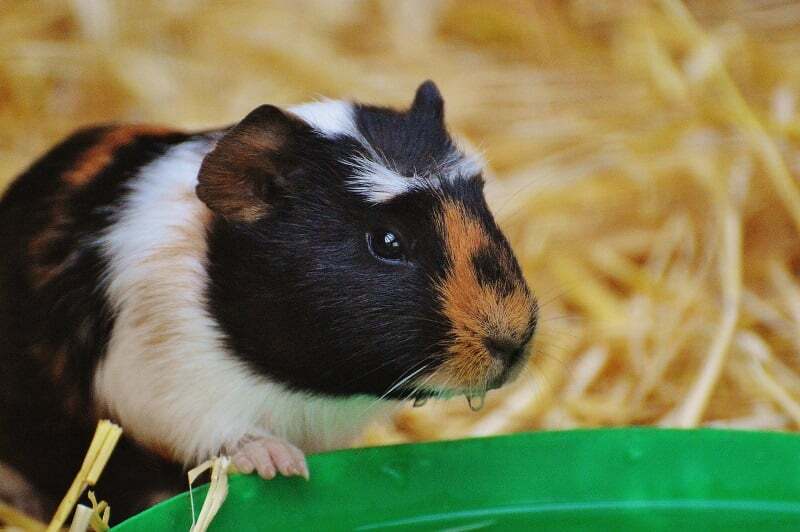 When we adopted Muffy and her sister, Lilly, from the guinea pig rescue, they had both been neglected and suffered with foot problems due to curling nails. So, I do my part to make sure their tender tootsies never have to suffer again. Some individuals believe that adding rough stones or bricks to a cage will help wear down claws and minimize the need to trim nails. However, this assumption is not only incorrect, but it’s also a dangerous misconception. By adding these rough surfaces to a habitat, you’re forcing cavies to walk on a surface that would wear down their entire paw pad, not just their claws. Doing so is painful and damages those tiny guinea feet. There are several different types of trimming tools on the market. However, the two most common ones are guillotine style clippers and grinders. Guillotine style clippers: with this style of trimming tool, owners place their pet’s nail through a hole and squeeze the handle. 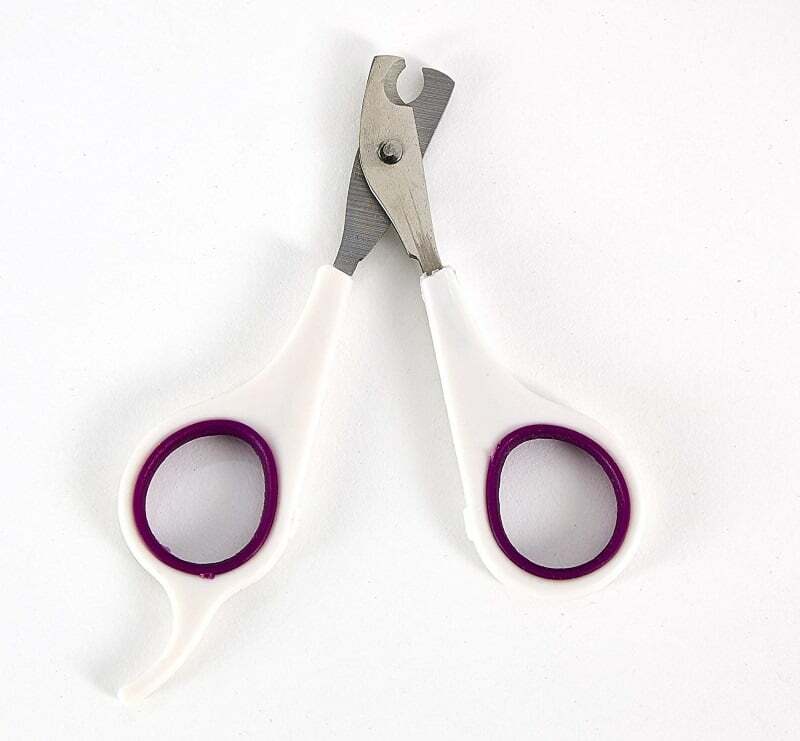 When you squeeze the handle, a single blade slices in a downwards motion across the hole and cuts off the excess nail. I use guillotine style clippers from Kaytee. Grinders: battery powered or electric, grinders use a small, rotating section of material to wear down your pet’s nails. Similar to sand paper spinning at high speeds, these Dremel grooming tools wear down the nails through the use of friction. Ultimately, when it comes to deciding which one is most ideal for you and your furry friends, the best choice will depend on two things: your pet’s personality and your grooming preference. For the most part, guinea pigs tend to be skittish little creatures, fearful of loud noises and sudden movement. Thus, clippers would most likely be the better option when compared to grinders. If, however, you have some truly brave beasties, then you can certainly consider the Dremel grooming tool. Ideally, aim to trim your cavies’ nails once a month, though you can certainly trim them more often should there be a need to do so. As with humans, different nails grow at different rates, so you’ll have to keep an eye on your pet’s tiny toes. Regular nail clipping helps keep the quick at an appropriate length for trimming and the nails in good shape for walking. Method #1: Sit on the ground and place your piggy “football” style under your arm, so they’re on your thigh with their rump against the side of your abdomen. This prevents your pet from backing up and keeps them in a secure position. Method #2: While sitting on a chair, hold your cavy upright, so they’re standing on their hind legs. One hand will support their hindquarters while the other one is placed gently yet securely around their chest to keep them against your body. If you’re on your own to trim nails, you can have your guinea sit on your lap, so you have a free hand to clip their claws. Method #3: Use a towel to gently wrap your pet “burrito” style, leaving one leg free for clipping. If you opt for this method, make sure your cavy isn’t wrapped too tightly, or they’ll overheat. Also, take a break in between claw trims to reduce stress. Truthfully, this is my preferred method as Muffy still freaks out at the sight of trimmers. Wrapping her up before she sees them really lowers her anxiety. The goal with nail clipping is, you want to trim the sharp tip of the claw off without cutting into the quick. The nail will start bleeding if you cut into the quick, and of course, this will hurt your guinea pig. Translucent or light-colored nails: The quick is always easier to see on nails that are light-colored or translucent. When looking at the nail, the quick is the pink part inside of the claw. Dark-colored nails: Although it takes some practice, you can sometimes guess where it’s safe to cut based on the shape of the nail if your guinea pig has dark colored nails. With darker nails, the trick is to clip off very small bits at a time. The tip of the claw, which is usually quite narrow and may almost appear hollow, is the safest place to trim. Make your cut in front of the quick, which is closer to the end of the nail. Cutting too close to the quick, even though you may not be on it directly, may still be painful for your pet. At most, clip off about 1/4 inch of the nail tip with each trim to avoid mistakenly going into the quick. Avoid bleeding by positioning the nail clippers below the red line. Apply styptic powder or use a styptic pencil if the nail starts to bleed. Apply pressure until it stops bleeding. 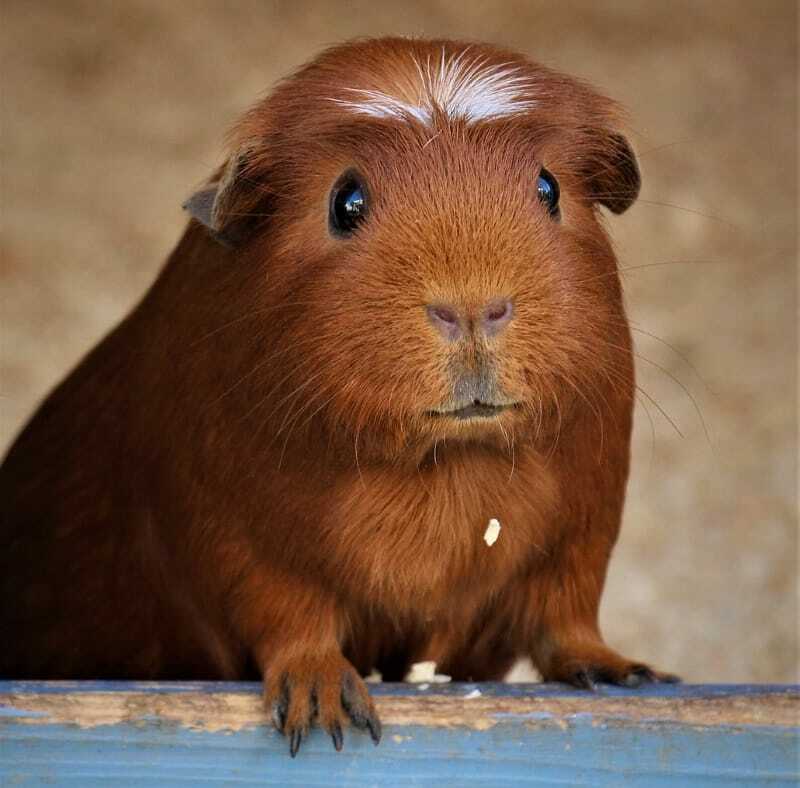 If you’ve never trimmed your cavy’s nails before and are worried about the process, ask an experienced owner, groomer, or veterinary technician to demonstrate a nail trim before you attempt it on your own. While some pet parents use regular human nail clippers, there are specially designed clippers for small animals like rodents. I use the Kaytee Pro-Nail Trimmer and highly recommend it as I find it’s better suited to cavy claws. I’ve also seen some great reviews about the Pet Republique Professional Nail Clippers. Human nails are flat, but a guinea pigs’ claw is rounded. Therefore, it’s best to use a tool that’s specifically designed for rounded nails. Additionally, human nail clippers tend to flatten the nail while it clips the tip, whereas a rodent nail trimmer works like a guillotine and cuts in a twisting motion. In general, it’s simply better suited to cavies. Styptic powder or pencil: Purchased in a small container or a stick version, this powder is very effective and stops the bleeding within seconds. By far, this is the method that vets recommend the most. While I’ve never tried using the stick version, I’ve used the powder for both my dogs and guineas. Truthfully, it works like a charm and I always have some on-hand. Cornstarch or flour: If you’re in a pinch and without styptic powder, try using cornstarch or flour in a similar manner – by dabbing the powder onto the tip of the bleeding nail. Apply pressure with tissue for minor bleeding: For minor bleeding, simply apply pressure to the top of the nail with a clean tissue. Above all else, before placing your pet back in its habitat, make sure the bleeding has stopped completely. If left with long, curling nails, your guinea pig will suffer. At first, you’ll notice they’re not walking as much, or they’ve simply stopped going up and down ramps. Quickly, this will lead to a loss of exercise and appetite as they are in pain. Then, long nails will progress into foot injuries, including such issues as redness, inflammation, and sores on the feet, leading to conditions like bumblefoot and hair loss. But, you can prevent all of this just by trimming your cavy’s nails on a regular basis, thus eliminating discomfort and pain. In the end, if you’re still not comfortable cutting your guinea pig’s nails, be it because you feel uncomfortable doing it or your pet is uncooperative, then seek the help of a groomer or veterinarian. HEllo, thank you for the info you shared i d like to ask a question abot guinea pig’s diet , i want to know if i can feed my sweet alfred with chew sticks other than apple tree sticks for ex in my yard there is mulberry tree, olive tree, poplar tree & lemon tree. So do you think i could use some of these trees little twigs. Hi, thank you for your question. I suggest you take a look at this page to get more info about the branches and leaves that are safe for guinea pigs: https://www.guinea-pig-advisor.com/feeding/food-list/ – under the “Branches and leaves” sections.